Romney's Debate Performance Swings Polls In His Favor : It's All Politics In the latest Pew poll, Republican presidential nominee Mitt Romney leads President Obama 49-45. Mitt Romney and President Obama wave to the audience during the first presidential debate at the University of Denver, on Wednesday. In the five days since Republican presidential nominee Mitt Romney was declared by many the winner of the first presidential debate, political watchers have waited to see if polls would shift in response to his performance. And, they did. Not only has the Gallup tracking poll tightened to a tie — 47-47 — but the Pew poll, which last month found President Obama with a strong lead among likely voters — 51-43 — has also seen a huge swing. In the latest poll, Romney now leads 49-45. "He had a 46 percentage point margin of victory in the debate; by a 66 percent to 20 percent margin, he was declared the winner by the people that we questioned," Andy Kohut, president of the Pew Research Center, tells All Things Considered host Robert Siegel. "According to Gallup, that's one of the biggest debate wins ever." Kohut says the debate had "a very positive impact" on Romney's image. "His favorable rating, for the first time in this campaign, hit the 50 percent mark," he says. "He came across as the candidate of new ideas over Obama by a seven-point margin, and he was seen, unlike a month ago, as apt to be as strong a leader as Obama. So he fixed his image very well in this debate victory." Obama also lost some of his popularity among women. In September, just 42 percent viewed Romney favorably, while 60 percent had positive impressions of Obama. 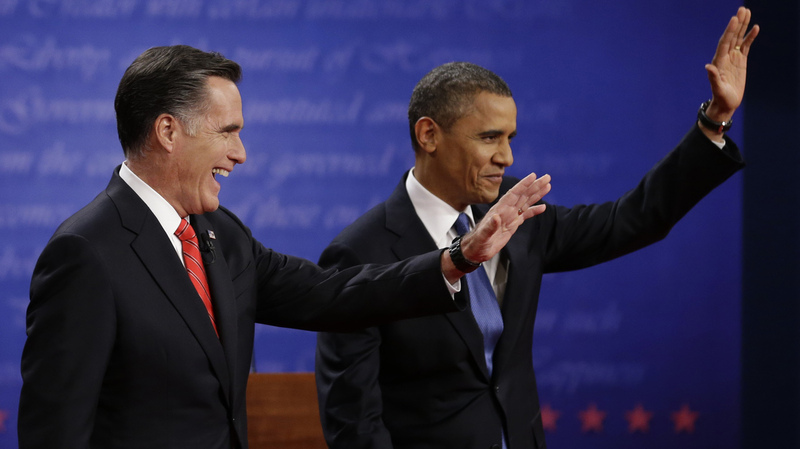 Now, 51 percent see Obama favorably; 48 percent see Romney favorably. Romney now finds himself doing well in some issue areas where he had problems among women. "Romney made gains on health care, taxes, foreign policy, the role of government," Kohut says. "He now ties Obama on those issues and he trailed by rather respectable margins a month ago. It's sort of an across-the-board win. And the climate of opinion is strongly Romney compared to a month ago when it was strongly Obama." Kohut noted that these polling numbers were gathered after the debate and amid new data released Friday, which show the unemployment rate fell to 7.8 percent last month. But Romney's jump in the polls comes with some mixed reviews. As many as 62 percent of voters agree with the statement: "Romney is promising more than he can deliver." And among swing voters, 75 percent say that people seem to be saying, "I don't believe he can do what he says, but I like what he says just the same." "Yes, and many of them say, 'It's hard to know what he stands for,' " Kohut says. "But on the other hand, a 54 percent majority of them say, 'We don't think Obama knows how to fix the economy.' And that's really what's going on here. People have mixed views of both of these candidates, and the candidate who is able to strike the right chords in any given moment will tap into the reservations people have about the other candidate and seem better by comparison."